Metal Replacement Head Every loves a metal head – they are stronger, easier to clean and also shinier. 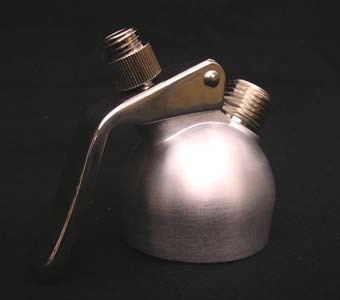 This replacement cream whipper metal head fits the standard whippers sold on www.creamchargers.org.uk and will also fit Mosa and Best Whip cream dispensers. These dispenser heads are die-cast in solid aluminium and are built to give plenty of service. They are superior to the plastic versions both I terms of the quality of the build and the ease with which they can be cleaned. NB: These will NOT fit the 16gm sized systems (either those sold by Cheeky Monkey Cream Chargers or those from other suppliers) These are not compatible with the stainless steel or professional whipping systems. Please contact us if you are unsure of the nature of your dispenser. To clean these replacement heads simply follow the instructions that came along with you original whipped cream dispenser. They are best cleaned with the original brushes but failing that a bottle brush will suffice. Do not clean in a dishwasher because damage to the product will almost certainly occur in time. Every replcement head comes with the relevant seals and gaskets. Every loves a metal head – they are stronger, easier to clean and also shinier. This replacement cream whipper metal head fits the standard whippers sold on www.creamchargers.org.uk and will also fit Mosa and Best Whip cream dispensers. These dispenser heads are die-cast in solid aluminium and are built to give plenty of service. They are superior to the plastic versions both I terms of the quality of the build and the ease with which they can be cleaned. These are not compatible with the stainless steel or professional whipping systems. Please contact us if you are unsure of the nature of your dispenser. To clean these replacement heads simply follow the instructions that came along with you original whipped cream dispenser. They are best cleaned with the original brushes but failing that a bottle brush will suffice. Do not clean in a dishwasher because damage to the product will almost certainly occur in time. Every replcement head comes with the relevant seals and gaskets.